Family-friendly places like Santa Claus Village and Duudsonit Activity Park - TornioHaparanda will thrill your kids. Get out of town with these interesting Rovaniemi side-trips: Sampo Icebreaker (in Kemi), Pyha-Luosto National Park (in Pyhatunturi) and Korouoma Canyon (in Posio). 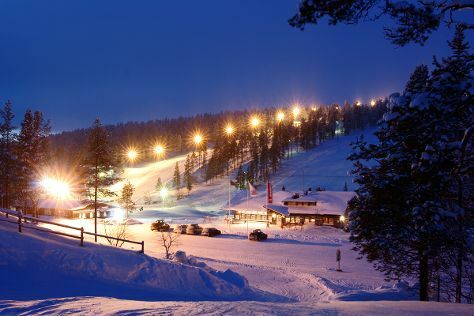 On the 7th (Tue), spend an exhilarating day on the slopes at Ski Resort Ritavalkea. There's lots more to do: see exotic creatures in open habitats at a safari tour, find something for the whole family at SantaPark - the Home Cavern of Santa Claus, look for all kinds of wild species at Kopara Reindeer Park, and take an in-depth tour of Arktikum. For where to stay, traveler tips, ratings, and more tourist information, use the Rovaniemi online sightseeing planner . In April, plan for daily highs up to 3°C, and evening lows to -3°C. Finish your sightseeing early on the 12th (Sun) to allow enough time to drive to Saariselka. Lapland Safaris Saariselka has been added to your itinerary. On the 13th (Mon), look for all kinds of wild species at Lapland Safaris Saariselka and then gear up at Saariselka Ski & Sport Resort. Get ready for a full day of sightseeing on the 14th (Tue): surround yourself with nature on a nature and wildlife tour and then find something for the whole family at Angry Birds Activity Park. For traveler tips, reviews, maps, and tourist information, refer to the Saariselka trip planning website . You can drive from Rovaniemi to Saariselka in 3.5 hours. Another option is to take a bus. In May in Saariselka, expect temperatures between 11°C during the day and 1°C at night. Wrap up your sightseeing by early afternoon on the 15th (Wed) to allow time for the car ride back home.